A zoo in the war-battered Palestinian enclave of Gaza is promoting itself as offering the chance to play with a lion, who has been declawed but still has its teeth. The 14-month lioness, called Falestine, is supposed to be placid enough to meet visitors to the park in Rafah in the southern Gaza Strip. "I'm trying to reduce the aggression of the lioness so it can be friendly with visitors," said Mohammed Jumaa, 53, the park's owner. Fayez al-Haddad, the veterinarian who operated on Falestine two weeks ago, watched her behaviour closely Tuesday as she was briefly taken out of her cage to be near local residents, including children. "The claws were cut so that they would not grow fast and visitors and children could play with her," Haddad said. There is no specialised animal hospital in Gaza so the operation was carried out at the zoo, which lacks the proper facilities. He denied that it was cruel to the animal. "We want to bring smiles and happiness to children, while increasing the number of visitors to the park, which suffers from high expenses." "(The lioness) does not lose its innate nature." But the Paw Project, an NGO which rehabilitates big cats, charges that declawing is inhumane and can maim the felines. 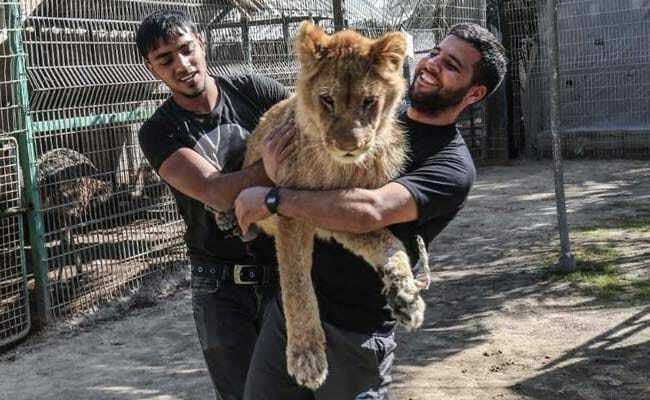 The cramped zoo in Rafah has five lions, including three cubs, along with a few birds and other animals. She interacted and played with zoo keepers, though for now guests were kept slightly apart as AFP watched. 12-year-old Anas Abdel Raheem insisted he wasn't scared as he leaned on the fence. "I am happy because I played with the lion and it did not bite me or tear my clothes," he told AFP. "My friends saw the pictures I posted on Facebook and WhatsApp." Haddad warned, however, that the claws grow back within six months. "Lions will not give up their offensive instincts." There are a number of small zoos, each with poor conditions. Last month, a litter of lion cubs froze to death at one. In 2016, the last animals were evacuated from what had been dubbed 'the world's worst' zoo, also in southern Gaza.